Manage all channels in one place in automated performance driven way. Acquired.io solves the problem of manual work when it comes to channel management, ad operation and budget allocation for user acquisition teams focused on mobile apps by giving them software that they use in-house to be effective. it to all the advertising platforms. Allocate / Change budgets with one click, instead of multi hour manual operation. them across variety of different channels without manual adjustment. Apply best performing creatives from one channel to another hassle free. Optimizing on sub publisher level, white list and black list. You connect all your existing channels. Also, we will connect to any ad platform you want, at no additional cost. of campaigns on its basis. so you can see what really drives your business. and flexible pivot table, you can easily drill deep into your data to compare revenue and other performance metrics on cohorts of users. the pivot table. 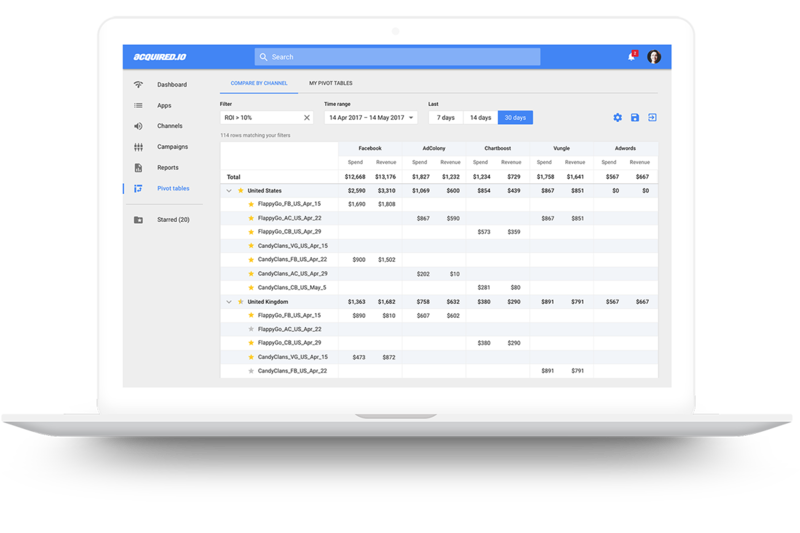 AIO automates updating the campaigns across all channels with new settings for the budgets, bids, geos, and creatives. Automated rules put more control in your hands. Rather than checking the performance of your campaigns daily, automated rules can run these checks for you and take the actions you'd normally do manually. Ready to join Acquired IO? © 2019 Acquired IO Inc. All Rights Reserved.